I am so excited by a little package I got in the mail the other day. 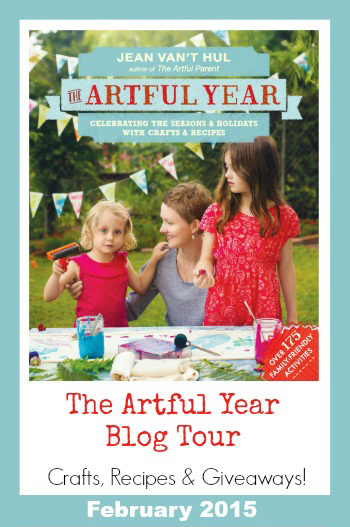 It was a copy of The Artful Year, a gorgeous new book by Jean Van’t Hul, the creative brain behind The Artful Parent. If you follow my Facebook page, you know that I love how she creates accessible ways to play with art. With a keen eye for what makes kiddos tick, you can always find that perfect project on her site to inspire creativity in your kids. And today, I’m giving you a sneak preview of her new book and making some fun tissue paper nests to make Easter more Artful. Jean gave me a copy of the book, but all of these opinions are my own (mainly because I’m an Artful Parent groupie!). Jean has written a lovely book to help you and your family live a more creative life in the coming year. 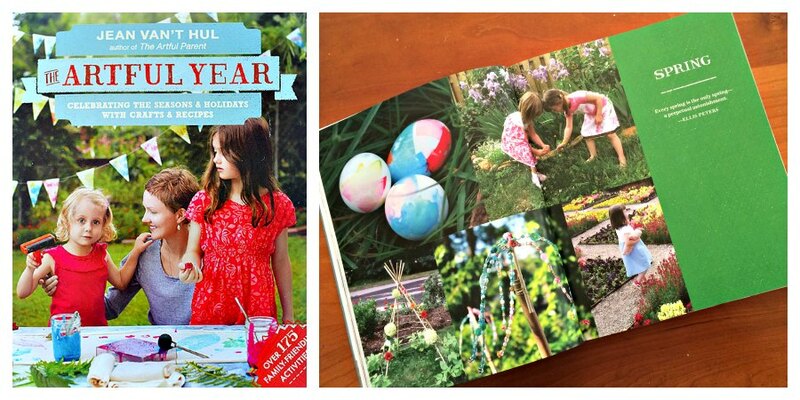 The Artful Year is filled with ideas, activities & recipes for every season and all of the major holidays. All written with her relaxed, easy to follow style that encourages kids and adults to have fun and get creative. My favorite part of the book? 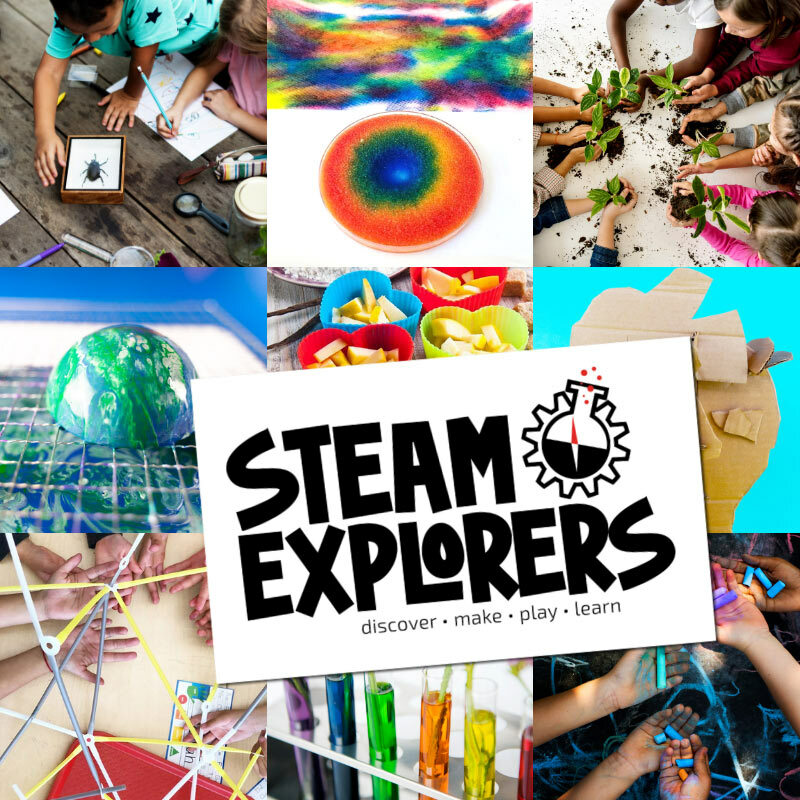 Art projects thatcan pair with recipes for deliciously fun family afternoons or best friend play dates. I had The Babe pick out her favorite projects in the book for us to try. She debated between play dough snow globes, getting her glitter on with a blue bird paper chain and making some yummy chocolate dipped pretzels. But Easter won out with all the colorful eggs and unique bird nests in the book. These colorful nests are a simple, sensory craft to do with the kiddos. And they make a gorgeous Easter decoration. Simply cover a small bowl with plastic wrap and cover with crumpled tissue paper dipped in water-diluted glue. Let it dry and then gently peel from the plastic wrap. We were impatient with the glue, so popped the bowl in a sunny spot on the patio and the morning’s project was dry by afternoon. And since we made a nest, of course we needed to decorate some eggs. I thought great, I have a dozen in the fridge, all ready to color. Then I remembered that they were brown eggs… Enter washi tape eggs, one of Left Brain Craft Brain’s very first projects. There are a bunch more creative ways to decorate eggs in the book. 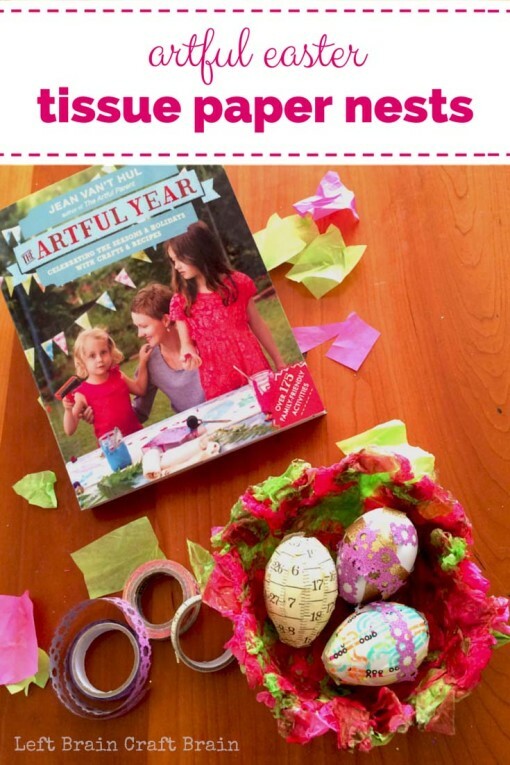 Be sure to pick up your own copy of The Artful Year to try out all of Jean’s gorgeous Easter decorating ideas. A few other creative blogging types had fun reading The Artful Year, too. Take a peek at their reviews for more creative activities, recipes and interviews with Jean Van’t Hul. Loving what you see from The Artful Year? Enter to win your very own copy of the book. 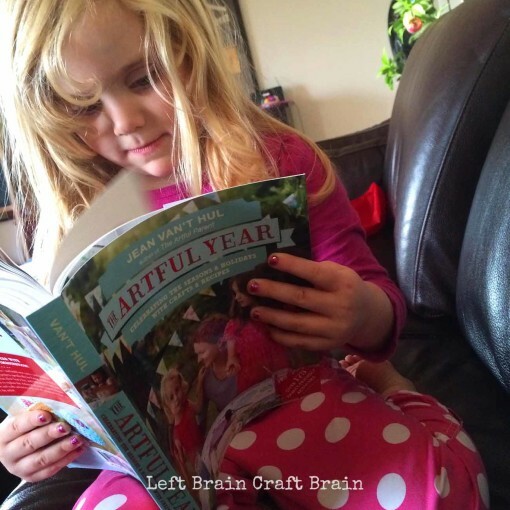 There are two ways to enter: 1) sign up for the Left Brain Craft Brain newsletter or 2) leave me a comment telling me what type of Easter arts & craft projects you like to do with kids. Traditional egg coloring (not too exciting- I know) is my favorite. I also had my 4 year old make string wrapped cardboard egg shapes last year while travelling in the car which she really enjoyed. Both sound like fun. Coloring eggs is always the favorite around our house. Last year we enjoyed making spring paper flower garland. Sounds beautiful! Good luck in the giveaway. It’s an amazing book. Mmm, chocolate! Sounds like fun. We do arts and crafts that I find on Pinterest. Pinterest is a great place to find ideas! The only craft that we usually do for Easter is coloring eggs! It’s not necessarily a craft but we create the “ugly” egg every year by dying it as many colors as we can. it always ends up being the prettiest egg of the day. Awesome. So fun! Great lesson for the kids, too. we love all types of crafts! Our favorite holiday crafts involve cooking. We love making easter nest treats – with crispy chow mein noodles and melted baking chocolate. They are the perfect place to rest chocolate robin’s egg candy. Mmmm… Robin eggs are my favorite Easter candy. I definitely need to try these nests. I love working with kids. We made eggs with strings wrapping it around balloons and then popping the balloon adding candy inside of it. Then we hide them. I love multi-part projects! This sounds great. Eggs wrap with strings and filled with candy. Sounds fun! We’ll have to try that this year. Sounds really interesting! Do you have a favorite material? We found beets and turmeric to be favorites so far. We also went on a hike and collected leaves and flowers, laid them flat onto the egg and tied them on with scraps of fabric. They made beautiful patterns, as did the fabric scraps where it was bunched. We did find that using fresh eggs from our friends without washing them first led to the color rubbing off later. The dyes adhered to the membrane surroundjng the egg and not the shell itself. But we all enjoyed it nonetheless. I should mention the eggs were brown, so the colors were muted and more natural rather than super bright. We find a new & different way to decorate our Easter eggs every year! We like to make Easter cards for our friends, and Easter baskets for their candy. We always decorate eggs also. That sounds very sweet and thoughtful! Tradition egg dying. Last year we tried putting on stickers before dipping them, then peeling them off once dry. A little challenging for small fingers, but a fun way to decorate nonetheless. Drawing on them with white crayons before dipping was also a success! I would love to try dyeing the eggs with silk ties or making resurrection rolls….or even spring buntings to add some color to the awakening world! This book sounds amazing as I am always sifting through websites trying to find challenging and fun activities for the kids. Sounds like you’ll be busy and having fun! I want to try resurrection rolls too. We usually try to make garlands or mobiles from found springy things. I haven’t thought about this year yet, but last year we painted ostrich eggs, we’re lucky to have an ostrich farm near us! Oh wow. Ostrich eggs would be amazing!! Such a big egg to color. 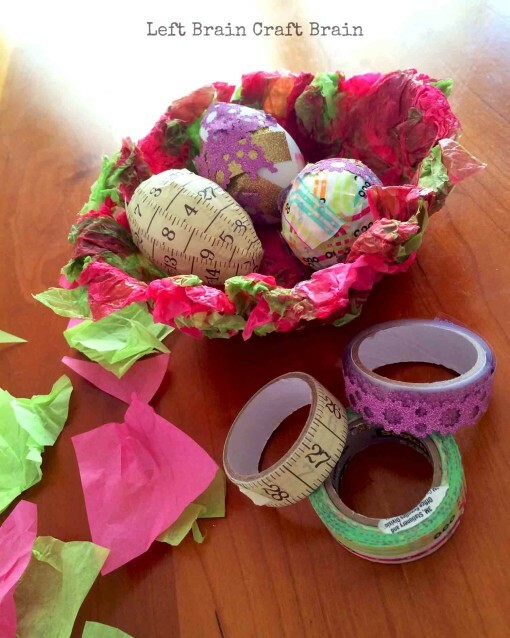 We made very similar paper mâché eggs one year using strips of scrapbook paper. They are still my favorite Easter decoration. These nests will be the perfect project to accompany them! 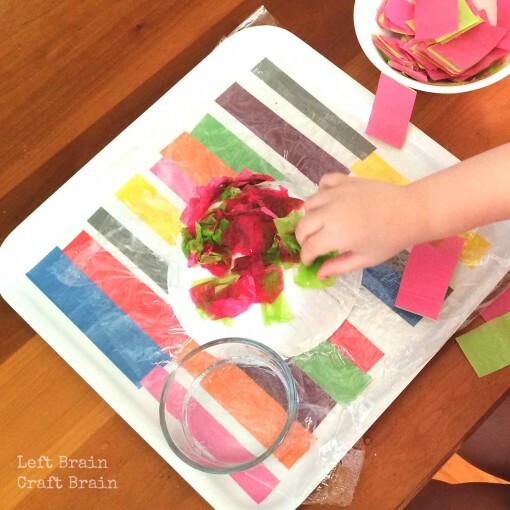 I follow the Artful parent on Facebook and LOVE her great ideas! Me too! She’s one of my favorites. I bet your eggs are gorgeous!